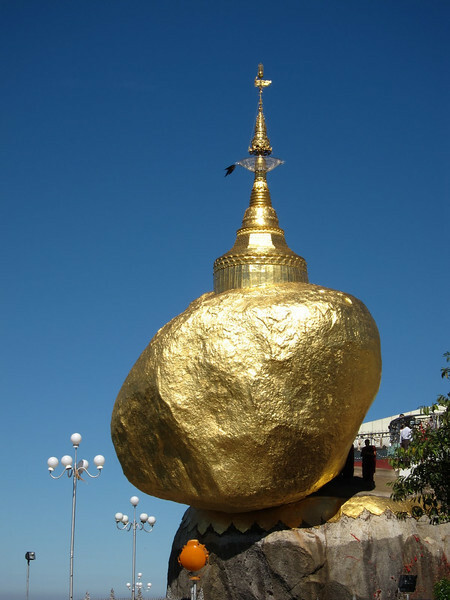 Of all the pilgrimage sites in Burma, the Golden Rock or Kyaiktiyo (proun. 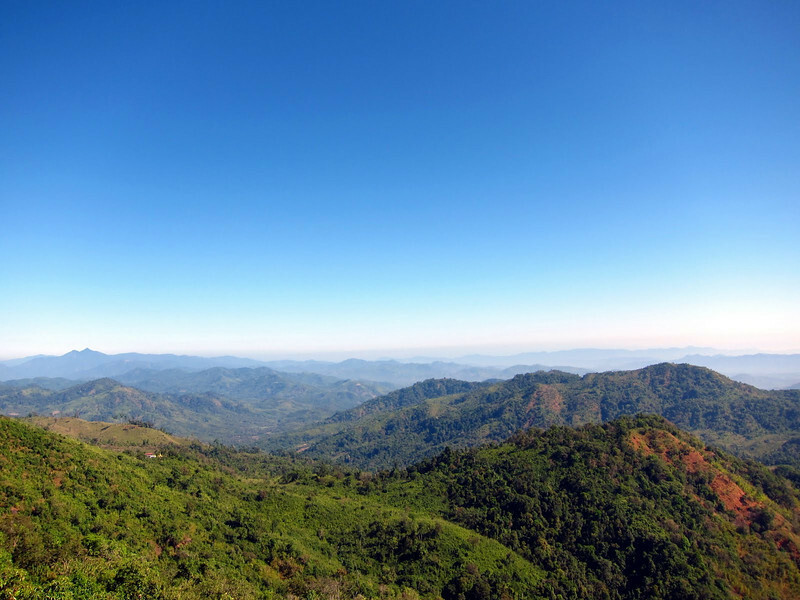 Chite-tee-yo) in Mon State was at the top of my ‘to do’ list, second only to the majesty of Shwedagon pagoda in Yangon. Balanced precariously at the edge of a cliff, the 18 ft tall rock is a sight to behold and is said to be perched upon a single hair of Buddha. 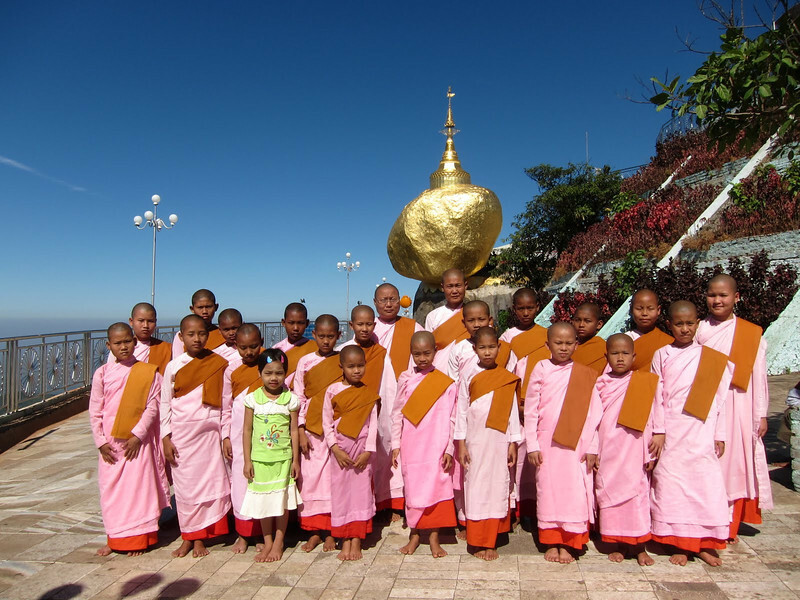 I will post on Kyaiktiyo in more detail, including the treacherous pickup truck ride to the mountain itself, but part of what made this pilgrimage magical for me was the gaggle of nuns from Mawlamyine who had come to pay their respects. With their orange or saffron or red robes, monks in Asia are hard to miss and are fairly omnipresent throughout Thailand, Laos and Myanmar. Given the political situation in Burma, the monks there are fairly outgoing and most try and talk about politics (provided you are not in a public place) or to practice their English. 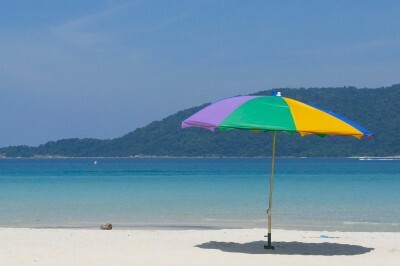 In contrast, the nuns, swathed in beautiful pink and orange robes, are fairly quiet and rarely initiate a conversation. Unlike the monks in the country, many of which become a monk for a few months and then return to their lives, most nuns remain nuns for the rest of their lives. Also unlike the monks, they do not travel abroad and are not supposed to preach. They are customarily reserved, and only within their own monasteries did they open up to me. However, when I said hello to this group of young nuns at the Golden Rock and offered to take a group picture for them, their faces blossomed into a multitude of bright smiles and the babbling and the enthusiastic hugs began. I must have spent close to an hour with them, comparing our feet or our hands or our height (“You! Myanmar size!”) and being dragged around to different parts of the pagoda. Definitely one of my fonder memories of Burma. Bus ride up to the Golden Rock was JUUUUST a bit crowded. Just a little. And the rock itself, in all its shiny glory. The photo is precious and the story of your time with them even more so. Beautiful memory. Cool story and picture! The "You! Myanmar size!" cracked me up. Thanks everyone. It was a lovely afternoon. Martin: the Myanmar size comment is a statement upon a greater theme – most of my time in the Philippines was punctuated with "You! Filipina size!" as well, and I've been hearing the same from the women in Cambodia. 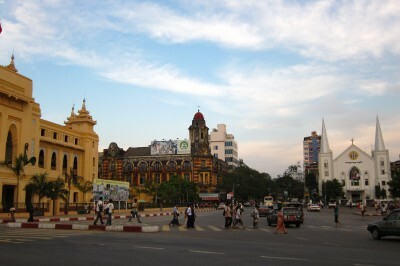 My favorite, however, was in Burma: my hostel owner said to me one morning "Excuse me, but why are you so small?" Seeing my baffled face, he added "foreigners are so tall, and you are small. Did you not eat enough as a child?" I went to get a foot massage in Zhuhai, China. The girl was washing my feet and lower legs, and then just started cracking up. Like, seriously, near hysterical laughing. I tried to figure out what was so funny, but the language barrier got in the way. She continued, and would start giggling every few minutes. I was starting to get really embarrassed until I realized that she thought it was hilarious how the hair on my legs would stand up when they got soapy. Her friend finally explained to me that it was like a monkey's legs. 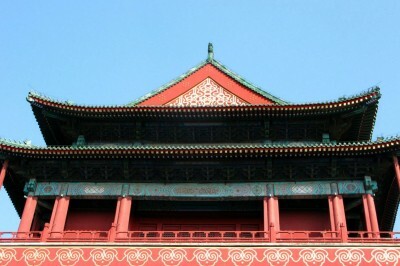 @Martin: Classic China. Please do go to Burma: kids will pull on your leg hair all day, every day. And they will stare up at you in awe whilst they cause you pain. Every guy w substantial leg hair was bemoaning that fact from Day 1.